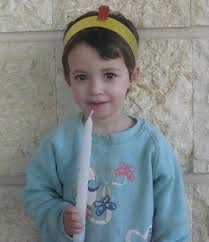 It is with deepest pain and anguish that we inform you of the passing of 5-year-old Adele Biton, HYD. She was critically injured two years ago in an automobile accident that occurred as a result of a rock-throwing attack by Palestinians in the West Bank. Amid the barrage of rocks, Adele’s mother lost control of the car and slammed into the rear of a truck parked on the side of the road. Adele’s two sisters and mother, as well as four other Israelis, were also wounded in the attack. After 18 months of operations and hospitalization, Adele was permitted to return home in August 2014. Now, a half year later, she slipped into critical condition in Schneider Children’s Hospital in Petach Tikvah with a severe bout of pneumonia that led to systemic complications. Chabad’s Terror Victims Project has been with the Biton family since the tragic terror attack. And we will continue to be there for them now to offer all the comfort, support and assistance that we can in the dark and painful days that they now face.